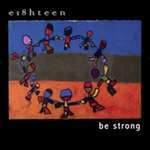 e18hteen and Dan Nichols have played to thousands of people, from every URJ camp in North America to major universities, CAJE and NFTY national and regional conferences, clubs and community concerts. With BE STRONG they meld primarily Hebrew lyrics with their Modern Rock sound, reminiscent of artists such as Third Eye Blind, Matchbox 20 and others. The recording includes original compositions, L'Takein (also known as The Na Na SongÂ�, a NFTY favorite) Chazak, B'tzelem Elohim, Laugh At All My Dreams, Sinu Ra, Pit'chu Li and 8 more songs.